The document briefly recapitulates what the General Public License (GPL) aims to achieve. The author goes on to explain the changes between versions 2 and 3 of the GPL, and the motivations behind the changes citing three threats to freedom. One of them is tivoization, named after the Tivo digital video recorder that contains GPL’d software but prevents users from modifying the GPL programs by validating a digital signature. The other two threats that led to changes in the GPL are Digital Rights Management and Microsoft’s patent covenenant. The author also refers to interfaces to other licenses. The author of the Quick Guide, Brett Smith from the Free Software Foundation (FSF), has posted the guide on the FSF announce mailing list. 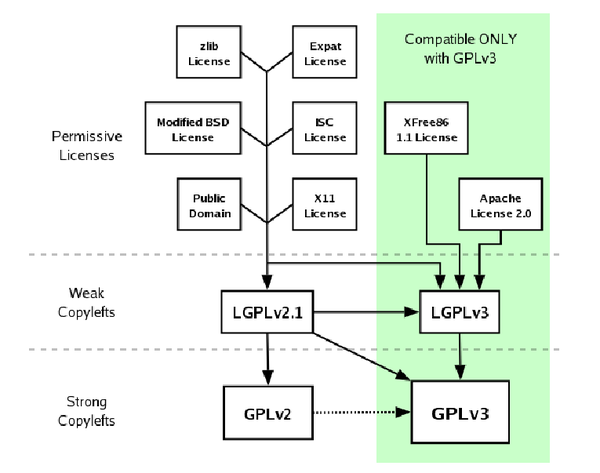 The changes introduced by GPLv3 include new compatibilities to other licenses, as shown by the graphic from the Quick Guide. The Open Source community can view the text as an impetus to understand the GPL as an opportunity rather than a bone of contention or a threat. Brett’s short, informal announcement closes with the words: "We hope this serves as a useful resource for developers considering adopting GPLv3 for their own projects." Shortly afterwards a senior Red Hat developer commented: "Excellent job, Brett." The Free Software Foundation (FSF) has released version 1.3 of its GNU Free Documentation License improving compatibility with certain Creative Commons licenses.